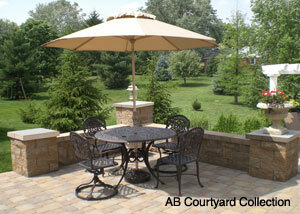 The Allan Block family of products provides attractive solutions to any landscape. With a wide variety of styles and colors, Allan Block is guaranteed to blend into your natural surroundings. Allan Block provides not only style and durability but an “Always Better” experience. Allan Block products are inspired by nature and manufactured with recycled materials in order to increase efficiency and minimize the footprint we have on the world we live in. Retaining walls are structures that are used to hold back a mass of soil, like a slope or a hillside, build a planter or to make more useable outdoor space. 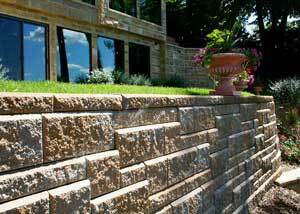 A two-sided wall system that is used to build a wide variety of outdoor living projects. Use them to build patio surrounds, seating walls, ponds, firepits, outdoor kitchens and more!